When your groceries are labeled “low-fat,” “sugar-free,” and even “natural” and "antibiotic-free," it’s easy to assume that you’re making healthy choices. Yet even some of those seemingly wholesome offerings contain chemical preservatives, pesticides, and artificial flavors and coloring that negatively affect your health. 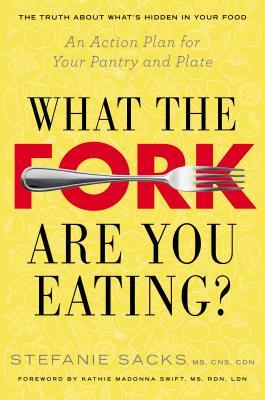 In What the Fork Are You Eating?, a practical guide written by certified chef and nutritionist Stefanie Sacks, MS, CNS, CDN, we learn exactly what the most offensive ingredients in our food are and how we can remove (or at least minimize) them in our diets. Sacks gives us an aisle-by-aisle rundown of how to shop for healthier items and create simple, nutritious, and delicious meals, including fifty original recipes. Stefanie Sacks, MS, CNS, CDN, is a culinary nutritionist—a certified chef with a master of science in nutrition from Columbia University. She is also an educator, speaker, consultant, and host of the radio show Stirring the Pot. Sacks is passionate about promoting wellness through food. After asthma, allergies, recurring bronchitis, and pneumonia shaped much of her childhood, she discovered how food could help her heal. She lives in Montauk, New York, with her husband, two active boys, and a yellow Lab. "While Sacks writes in a similar style to Marion Nestle and ­Michael ­Pollan, her book is more accessible and practical for people seeking the motivation and tools to follow a healthier lifestyle, emphasizing that even very small changes in diet can make a big difference in health.... This is a valuable guide to evaluating, choosing, and preparing food for wellness." "Stefanie Sacks shines a bright light on the dark side of our food supply, but she doesn't resort to fear-mongering and she doesn't leave you hanging. Rather, she offers a sensible, step-by-step plan for making the best food choices in the real world. Her non-judgmental, balanced approach and inspiring recipes are just what we need to make healthy changes that last." —Stephen Cowan MD, FAAP, author of Fire Child, Water Child: How Understanding the Five Types of ADHD Can Help You Improve Your Child’s Self-Esteem and Attention.